Shoppers walked through the aisles of Vincente&apos;s Supermarket in Brockton in 2015. 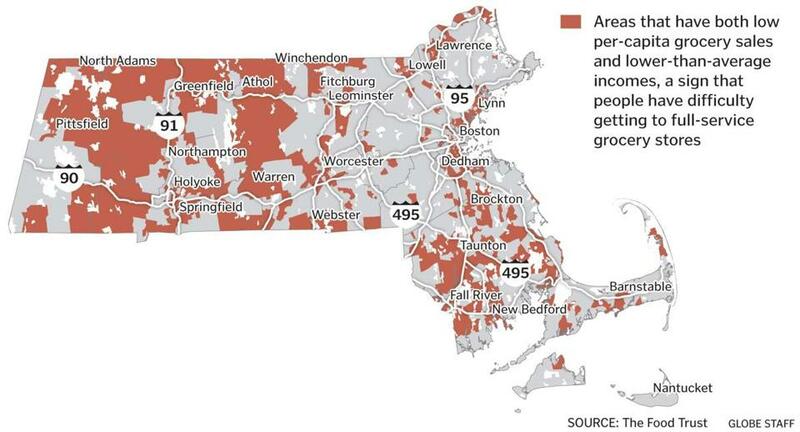 Brockton is one of the state’s cities with the biggest grocery access problems. It’s not hard to find a McDonald’s in the Mason Square section of Springfield. Liz O’Gilvie has counted 10 within a mile and three-quarters of her home. But the nearest full-service grocery store, with plump apples and curly kale? That’s 2 miles away, and going that distance on public transit requires a two-hour trek on three buses. O’Gilvie is among the nearly 40 percent of Massachusetts residents who live in places where it’s difficult to get to a supermarket and buy nutritious food. A new analysis done for the Massachusetts Public Health Association found that these areas of limited grocery access — sometimes called “food deserts” — stretch across a surprisingly wide swath of this prosperous state. It encompasses 2.8 million residents, including 700,000 children and 523,000 elderly people. 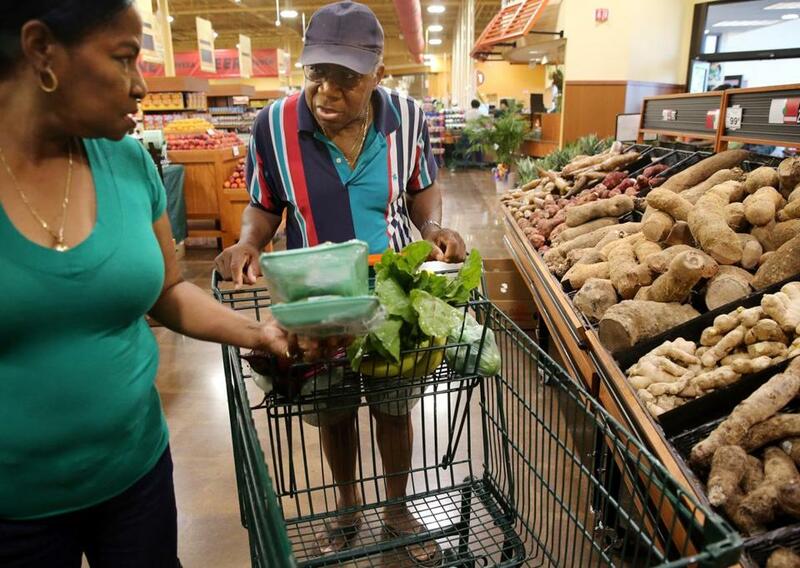 “People talk about food deserts. We’re like a food swamp,” said O’Gilvie, chairwoman of the Springfield Food Policy Council. For lack of alternatives, people in her predominantly African-American neighborhood often shop at convenience stores more likely to sell chips and cookies than spinach and cauliflower. O’Gilvie has witnessed the results: neighbors with limbs lost to diabetes, high obesity among the community’s children. The analysis identified the parts of the state where people have below-average incomes and where grocery-store sales are also below average. The low grocery sales suggest people are shopping elsewhere, perhaps at convenience stores, said Miriam Manon, senior associate at the Food Trust, the Philadelphia nonprofit that performed the analysis. The cities with the biggest grocery access problems include Chelsea, Springfield, Taunton, Everett, Revere, Lawrence, Lowell, Lynn, Brockton, and Chicopee. To tackle the problem, the association advocates an approach that has worked in 10 other states: Create a financing mechanism for building big grocery stores and renovating or expanding smaller ones. In 2014, the Legislature agreed to try that approach: It established the Massachusetts Food Trust Program , but did not initially provide the money needed to start it. Last year, the Legislature got the ball rolling by authorizing up to $6 million in capital spending and $100,000 for operations. But it’s still not a done deal. The program will begin only if Governor Charlie Baker includes it in his capital budget, expected next month. Baker spokesman Brendan C. Moss, noting the current budget included $1 million for a separate program addressing food access, said the governor would announce his capital budget before July 1. If the state provides money for the food trust, a nonprofit bank would be established to raise additional funds from the private sector. The bank would then provide loans and grants to organizations boosting access to fresh, nutritious foods. The first such program, in Pennsylvania, has funded more than 70 businesses. In Ohio, $2 million in state money for the Healthy Food for Ohio program attracted $8 million in private funds. In Lawrence, a community organization has worked with bodegas around to the city to encourage them to provide healthier food. But to maintain an array of fresh produce, many stores need more financial aid to expand or buy refrigerators, said Heather McMann, executive director of Groundwork Lawrence , an organization that promotes health through environmental changes. The food trust could provide such help. In Boston’s Dorchester neighborhood, residents have formed a cooperative that is laying the groundwork to build a grocery store owned by workers and the community. The Dorchester Food Co-op, incorporated in 2012, would welcome a food trust grant to boost its efforts to build membership and secure a location, said Darnell Adams, project manager.